Welcome to Websoftex Real Estate Management Software. Websoftex Software Solutions provides a software solution for real estate companies. Real Estate is an ever-growing business, it is best to manage it with an efficient software instead of manual paperwork. 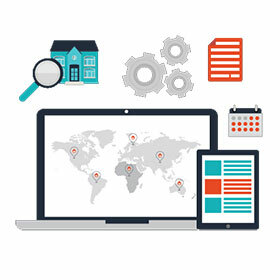 Software is easy to make updates in rates, locations, availability, ownership and other details regarding properties. This software is available your mobile phone for your convenience. Availability of data is a boon for your business, it makes you ever-ready for the deals you are going to make. Property can be viewed via Google maps, which is integrated with the software.